They rarely talked about the tragic loss of their first child. Sixty years later, sifting through my grandfather’s old letters helped me see their lives in a whole new light. My grandmother was in labor too long, and the baby kept hitting her head on my grandmother’s pelvis, trying to get out. She should have had a C-section but wasn’t given one. 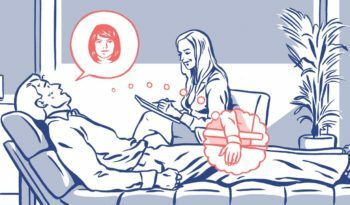 When Paula was finally delivered, they discover she had sustained a cerebral hemorrhage. She developed hydrocephalus – the buildup of too much spinal fluid and pressure on the brain – and died a few months later. Had she been born a little later, she could have survived. The same year Paula was born, 1949, surgeons Frank Nulsen and Eugene Spitz developed a successful treatment for hydrocephalus: a shunt implanted into the caval vein with a ball valve, relieving the pressure. Prior to that, hydrocephalus was a death sentence. This isn’t part of the story I grew up with. The story I know stops at Paula’s death. I always silently tack on what I think of as a semi-happy ending – the birth of the three children my grandparents would go on to have: my mom, Aunt Sue, and Uncle Larry. It’s a static story, a fact of life: Paula died and my mom, aunt, and uncle lived. I don’t think there is any more to the story until I find my grandfather’s Korean War memoir while helping get my grandparents’ house ready to sell in 2008. By this point, I’m 26 and my grandfather has already been gone for five years. Only once did I feel and wonder whether I was going to crack completely. There was no future; there was nothing to hope for but wait for the inevitable end – death – which came to our first baby several months after birth. Our catastrophe, our ordeal under fire, happened only two years ago – do you remember? Our baby girl, named Paula after my beloved grandmother, was born after a difficult labor of 24, 48 hours; a Caesarian section should have been done. The pediatrician said that our little darling had sustained a cerebral hemorrhage, that hydrocephalus would develop, that it was only a matter of a few months. We kept the beautiful little tyke at home for a month: she gurgled, she laughed, she thrashed about, she feasted on breast milk, even on baby food; we laughed, we enjoyed her antics, we thought how wrong the doctor’s dire predictions were. For a month we lived in paradise but our joy was short-lived: we had to send our baby to a hospital to die slowly as its head grew progressively larger until you could barely look at it, until I felt numb and helpless. Tears are streaming down my face as I write this account. The tidy narrative I’ve created in my head disappears with each new painful detail my grandfather reveals. I realize I’ve never really considered what it had been like for my grandparents to live through the experience. But now I can see them going from expectant parents to new parents and a baby with a brain injury. I can see how scary and devastating the prognosis must have felt in contrast to the hope of that first month with Paula. And then to watch your child slowly die, becoming more and more unrecognizable to you every day. Now that I’m a parent, I know there is no semi-happy ending to this story; there’s no ending at all. My child would always hold a space in my life. Paula and the author’s grandmother, Ruth Goldstein. Paula’s head is bandaged, probably because of an operation to reduce spinal fluid buildup. My grandfather’s description allows me to imagine Paula alive for the first time. Up until now, I don’t think she ever felt real to me. I want to learn more about her, but my grandfather doesn’t refer to her again in his letters. Instead, I find other Paula-related items. I find my grandparents’ early love letters and a photo album that begins when they were dating and continues on into the first year of their marriage. My grandfather wrote detailed captions to accompany the photos. Because of them, I discover that my grandmother had gotten pregnant almost right after they got married. The album abruptly stops toward the end of her pregnancy with Paula, with a couple of photos obviously removed. All that remains are my grandfather’s captions and the photo corners to mark where the photos have been. One caption reads, “Five months pregnant and hiding her growing belly.” The last caption is, “Nine months pregnant and cooking dinner.” I fill in the photos with imagined images – my grandmother posing with her body half turned and a little behind a friend or relative. My grandmother with a frying pan, smiling, no longer able to hide her protruding stomach. I find a Valentine’s Day card my grandfather sent to my grandmother a couple of months before she gave birth. On the envelope he wrote, “To my sweetheart approaching her greatest moment in womanhood.” On the front of the card is a young girl with blond curls in an elaborate dress, holding a parasol. My heart drops when I read his hopeful words, his original message getting buried in hindsight. I also discover receipts for flowers they sent to Paula’s grave, year after year. At first I think the receipts are for one of their grandparents, but then I see the section the person is buried in at Hebrew Memorial Park: Baby G – 116 – 5779. The receipts start in the 1950s and go all the way until the ’90s. I ask my mom, aunt and uncle about the flowers and none of them know about it. Of the three siblings, my mom was always the family historian. If my aunt or uncle had a family question, they would ask my grandmother or her. But even she doesn’t know about the flowers or the photo album. “They sent flowers? For how long?” my mom asks. Her eyes widen a little. “I didn’t know,” she says, shaking her head. With each new discovery, I slowly begin to see the ricochet effect Paula’s death had on my family. I see connections between family stories and quirks where I haven’t before. I wonder how my grandparents felt when my grandmother became pregnant with my mom. If they were nervous about my mom’s health, or if having a scheduled C-section date was reassuring. Was the date they choose for her birth – April Fools’ Day – their way of lightening the situation? How was my mom treated differently than Sue and Larry, who came seven and nine years after Paula, respectively? My mom sometimes talks about feeling a certain amount of pressure from my grandparents as the oldest (living) child, though my aunt and uncle don’t think she was treated any differently. Of course, just because they didn’t notice any difference doesn’t mean there wasn’t. They both note that my mom has always been introverted and sensitive, that she is prone to people pleasing. She might have turned out that way anyway, but her personality traits also match what my grandparents might have needed after Paula – a highly intuitive and sensitive child who went out of her way to please/comfort them. Paula shows up in other aspects of my mom’s life as well. My mother’s middle name – Faith – is a direct reference to my grandparents’ experience. Likewise, it was important to my mom that both my brother and I have names that honor Paula, so my middle name is Pamela and my brother’s is Paul. My mom was also forever worrying about my brother and me getting sick. She was extra vigilant about us taking vitamins, moving away from people who coughed or sneezed, and taking jackets even when it wasn’t cold out (68 degrees!). Every time we sneezed, she’d have us wash our hands, even if we hadn’t sneezed in our hands. Eventually, she began to advocate for sneezing in the crook of our elbows (something I just could never get behind, even if Bruce Willis did it, like she claimed). As the years went on, she washed her hands too frequently, until they were cracked and bleeding. She closed public restroom doors with paper towels. I didn’t realize until much later that these habits (along with hoarding, which my grandmother also did) were symptoms of obsessive-compulsive disorder, a mental illness with symptoms that can include compulsive fear of harm or death coming to loved ones. She passes away in 2013, two years after being diagnosed with a cancer that might have been treatable had her doctor caught it earlier. I try to imagine how things might have been different for my mom if Paula had survived. She would have had a sister to teach her things and set an example. My grandparents would have got out some of their parenting kinks on Paula. And of course there wouldn’t be the weight of her death hanging over all of them. Then again, had Paula lived, my uncle Larry might not have been born. My grandparents only wanted three children, and with Paula in the picture, my grandparents might have stopped at Sue. Sometime before Larry became a doctor, my grandmother dreamt that his hands would do good things (like surgery), reassuring her that Paula’s death was not in vain, that Larry was meant to be alive. The last Paula-related items I find are negatives. I peer at them cautiously, careful not to get my finger smudges on them. By this point, I know all the family pictures so I expect to see familiar images. Instead, I see an unfamiliar baby crying, getting her diaper changed, being cradled in my grandmother’s arms. My grandmother looks down at her, a smile taking over her face. The baby has a bandage on her head. In other pictures, if you look closely, her head appears slightly enlarged. I can’t believe it! My grandparents threw away the original pictures in an effort to move on, but had saved the negatives. I rush to get the negatives developed. When I return to pick up the pictures, I quickly open the envelope and grab the first photo. Then I just stand there for a while, taking in her features, thinking how much she does and doesn’t look like my mom. Mostly I am struck by how normal the pictures are. Paula seems just like any newborn adjusting to the outside world. Had I not known the backstory, I wouldn’t have guessed the outcome. There is also something surreal about finally being able to see Paula. I have spent so much time imagining her, a real image almost seems unimaginable. Yet there she is, the real Paula, no longer needing to be imagined. This is Paula alive, before her story comes to an end, before she becomes a part of our family history. And in these pictures, that moment in time, she will always be alive. A story in motion, without an end. Jannie Duncan: “Beautiful Human” or Fugitive Killer? This Black Woman Was Once the Biggest Star in Jazz. Here’s Why You’ve Never Heard of Her. Fifty years ago, a left-wing radical planted bombs across New York, launching a desperate manhunt—and an explosive new strain of political extremism. Throughout much of 1968, Sam Melville, an unemployed 34-year-old with an estranged wife and 5-year-old son, frequently sat at his desk in a squalid apartment on the Lower East Side of Manhattan, contemplating how he could destroy America. Yet in the flashpoint of just four months, Sam Melville and a small group of followers took the American radical left on a hard turn into armed struggle. In his book Days of Rage, about terrorism in America in the ’60s and ’70s, Bryan Burrough called Melville and his corps “the essential blueprint for almost every radical organization” in the 1970s. Melville was one of the first to turn to this kind of violence, but the country would soon witness the kidnapping of Patty Hearst by the Symbionese Liberation Army, the bombings of the Pentagon and NYPD headquarters by the Weather Underground, and more. “THIS RELEASE IS FOR THE UNDERGROUND MEDIA ONLY. THERE WILL BE NO COMMUNICATION WITH THE PIG MEDIA.” Those words were emblazoned across the top of the communiqué that followed the bombing of the Marine Midland Bank Building on August 20, 1969. Composed by his then girlfriend, Jane Alpert, and others who would later be christened by the FBI as “the Melville Collective,” the statement was sent around to local underground weeklies, including the one where Alpert held a staff writer position, Rat Subterranean News. The communiqué explained that the reason behind the massive explosion was the banking institution’s links to the oppression of sugarcane field workers in Latin America. But in Alpert’s 1981 autobiography, Growing Up Underground, in which she chronicles her transformation from Swarthmore honor student to radical fugitive, Alpert claims the action was bereft of any political thought on Melville’s part. The communiqué had to be cooked up afterward to cover up the real excuse for the bombing: his anger over Alpert seeing other men. The one thing nobody can debate is the haphazard manner in which Sam Melville went about bombing Marine Midland. Though his intention was to destroy property and not people, he did not take into account the presence of an evening staff in the building when he set the device for a 10 p.m. detonation. When more than a dozen employees were taken to the hospital — all with minor injuries — it forced him to rethink his future plans of attack. To assure nothing like this would happen again, Melville culled a crew of seven, including Alpert and Robin Palmer, a member of the Downtown Manhattan anarchist group “the Crazies,” to help him scope out potential new targets, craft communiqués, and plant the bombs. After weeks of meticulous planning, Alpert kicked off the group’s revamped campaign by planting a bomb in the Federal Office Building on Friday, September 19, 1969, targeting offices of the U.S. Army and Selective Services inside. The device went off at 2 a.m., destroying files, damaging the building’s electricity infrastructure, and causing flooding. There were no injuries. Melville and his cell soon learned that damaging federal property could elicit a furious response. The next day, the FBI went to an apartment Melville had moved out of months earlier, and later they tracked him down at the apartment on East 4th Street where he and Alpert were living. He told them his name was David McCurdy — the pseudonym he had used to rent a nearby apartment where he had set up an explosives workshop — and denied knowing who Sam Melville was. Unfazed by this close call, the collective went to work plotting their most ambitious statement on American tyranny yet: a trio of simultaneous bomb blasts across the city on Veterans Day. Meanwhile, Melville opted for his version of laying low: skipping town and going on a bombing spree of U.S. Army facilities across the Midwest. According to a book by Christopher Hewitt, Political Violence and Terrorism in Modern America, the explosions in Chicago; Madison, Wisconsin; and Milwaukee caused a total of $125,000 in damages — with Melville’s goal of zero injuries. Melville also participated in a guerilla warfare workshop in North Dakota, hosted by the black nationalist H. Rap Brown. At Melville’s urging, Robin Palmer was sent to plant a device the very next day at the Criminal Court Building on Centre Street, in response to the trial taking place there of a group of Black Panthers charged with attempts to bomb police stations. Another blast was planned to follow at the Lexington Armory on 26th Street, with Melville delivering the bomb himself with help from George Demmerle, a newer member Melville had befriended on the Lower East Side. Demmerle, an overly rambunctious radical who not only was a member of the Crazies but also held rank as the only Caucasian member of the Black Panthers, greatly impressed Melville. The only thing stopping Melville from meeting up with Demmerle to execute the bombing, according to Alpert’s book, was the white sedan parked out front of his and Alpert’s apartment — the same one he’d seen there earlier in the week. Could his clumsy blurt of the name David McCurdy to the FBI agents have tipped them off? Had they found his bomb factory? He couldn’t sit and ponder what the answer might be. He had to mobilize. The revolution was in full swing. Not long after the explosive on Centre Street, Demmerle and Melville made their way uptown, to 26th Street. The plan was to chuck the timed bombs onto the large Army trucks parked in front of the 69th Regiment Armory, knowing they would later be brought inside the building. But as Melville approached, he noticed something different than the numerous times they had cased the building. The trucks were now parked on the opposite side of the street, near people’s homes. His son, Josh, believes he didn’t want to risk hurting any more innocent people. Figuring the action would have to wait for another day, Melville was just about to turn away when he was bombarded from all angles by FBI agents pointing pistols and ordering him to freeze. Concurrently, Jane Alpert and John David Hughey III were rounded up at the already staked-out apartment on East 4th Street. The feds’ biggest tipoff came from the person assisting Melville with the botched Armory bombing itself: George Demmerle. Just like Melville, Demmerle was a man who had left his wife and child looking for purpose in life, but instead of becoming a self-appointed revolutionary, he found it as a low-level mole for the government, beginning in 1966. To many on the scene, Demmerle’s attempts to nudge members of the counterculture into outrageous acts like blowing up the Brooklyn Bridge seemed suspicious. But to Melville, Demmerle was just another comrade in the struggle. Two months into the new decade, Sam Melville stood broken in the Federal Courthouse on Pearl Street. While Alpert and, later, Hughey walked on a $20,000 bond, Melville watched his bail climb higher and higher, and when Judge Milton Pollack raised it to $500,000, an anxious Melville rose to his feet and, according to The New York Times, bellowed, “I don’t have half a million dollars! How the hell am I going to get out of jail, jackass?” Although his remark did not amuse Judge Pollack, it garnered a chuckle from the radicals looking on. A month after his outburst in court, Melville pulled another act of desperation. He attempted an escape by restraining a marshal in the courthouse with the marshal’s own belt and making a run for it. After racing down two flights of stairs, he was apprehended. On May 8, 1970, Melville pled guilty to three charges: conspiring to and destroying federal property, and assaulting the marshal. He was sentenced to a consecutive run of 31 years. Hughey ended up serving two years, while Alpert absconded. While harbored by members of the Weather Underground, she circulated the feminist manifesto Mother Right to much praise and criticism from the radical left, before surrendering in 1974. Melville ended up at the Attica Correctional Facility, in Western New York, in late 1970. There, abusive guards were the norm, as were ludicrously sparse rations such as a single bar of soap every other month and one roll of toilet paper given out only once a month. The lone bright spot for Melville was finding prisoners to connect with from the Black Panthers and a likeminded Puerto Rican civil rights group called the Young Lords. Over the course of the next year, Melville sent out a storm of letters decrying the conditions at Attica to lawyers, outside supporters and the New York Commissioner of Corrections, Russell Oswald, while also publishing a handmade newsletter distributed to prisoners on the sly called The Iced Pig. For many both inside and outside of prison walls, this new awareness of incarceration conditions came from George Jackson, the San Quentin inmate who authored the best-selling book Soledad Brother. Jackson’s lyrical, vengeful writing style resonated with fellow prisoners, while enticing the romantic radicals of the New Left. 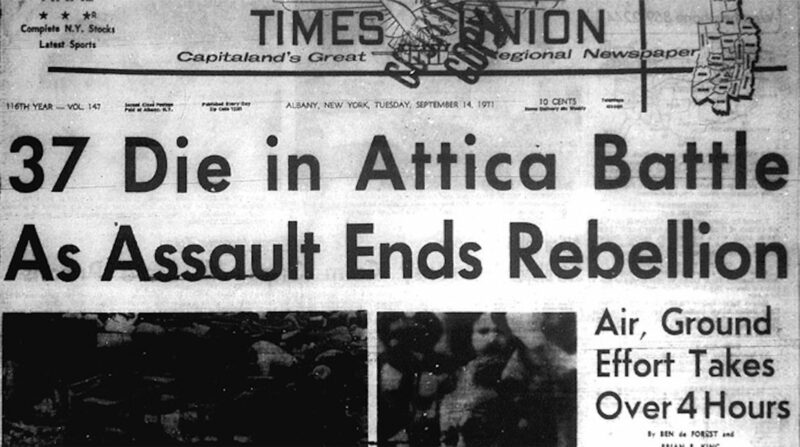 When word got out that Jackson had been shot dead during a bungled uprising on August 21, 1971, it set off a brooding fury in Attica. In an act of solidarity, Melville led a multiracial phalanx of prisoners wearing black armbands into the mess hall for a very solemn hunger strike. For months after Melville’s arrival to Attica, an obvious resentment had smoldered between inmates and guards, but the death of George Jackson ignited the spark. Over the next four days, negotiations were volleyed in and out of the prison walls by journalists, senators and the well-known civil rights lawyer William Kunstler. He came out of the prison saying it resembled a “sloppy boy scout camp,” due to the makeshift tents in the yard and trenches Melville and other inmates had dug for protection. New York Governor Nelson Rockefeller refused to buckle to the inmates’ demands, and on September 13 he sent armed state police in to take back control of the prison by any means necessary. At the end of the sudden and bloody debacle, nine guards and 29 inmates were dead, with Melville reportedly being one of the first to get picked off. Legend says Melville was in mid-throw of a Molotov cocktail when he was gunned down. As much as that would make for a great dramatic ending to this made-for-TV story, evidence brought up in a civil suit during the 1990s revealed this to be a mistruth, as no such item was found near his body. At Melville’s funeral, William Kunstler delivered a riveting eulogy, while various Black Panthers icily stood guard around Melville’s casket. A few days later, the Weather Underground bombed the offices of the Commissioner of Corrections to protest Melville’s slaying. For an almost 10-year stretch starting in 1975, a group that initially called themselves the Sam Melville Unit carried out a series of bank robberies and bombings across the Eastern Seaboard and the Midwest. While other girls my age were sneaking off with boys and getting drunk, I was becoming a zealot—and trying to convert my parents. On a summer Thursday evening, shortly after my 16th birthday, my face was pressed into the maroon carpet again. Mildew filled my nostrils and I coughed. My youth pastor’s wife, Jessa, was playing piano, and my youth group friends and I had spread out and each found our own nook on the floor to meet God. “The only thing holding us back from being in the Secret Place is our own sin,” Jessa shouted, her neck held high. I was mesmerized by the way God moved through her. The Secret Place of the Lord was the place we could dwell if we lived holy lives. In the Secret Place, God would whisper divine revelations to us and show us miracles. I dug my face harder into the floor — lying prostrate was how we humbled ourselves before the Lord. I sang, improvising a new melody to the Lord. I felt something release as I sang, something like the warmth of God. I kept singing and the tears started flowing, as they always did when I prayed long enough. They dripped off my face and darkened the carpet underneath. I’d joined the fundamentalist Pentecostal church when I was 13. I was a homeschooled girl with only a smattering of friends. My best friend, Siena, lived just down the road from me, on the pine-speckled canyon seven dusty miles from town. I adored her, but Siena was a public-school jock by then and had way cooler friends than me. I was lonely, and this Pentecostal church had the only youth group in town. I wanted a group to belong to. Didn’t we all? At least that’s how it began. Not long after joining, I was all in. I prayed in my room for hours every day. I spoke in tongues and believed I was slaying demons as I prayed in my spiritual language. I threw out all of my secular music. I went on mission trips to spread the Gospel. I cut out my non-Christian friends. I signed a contract promising that I would protect my virginity for my wedding night. I dreamed of becoming a pastor’s wife or a missionary. My parents were nominal Christians, but not churchgoers. After I joined the Pentecostal church, Jessa and her husband, Jacob, the youth pastor, suggested that, while lovely people, my parents weren’t the Godly authority I needed. I deserved parents who would guide me into the Things of the Lord. They told me that sin could be passed down for generations and that people born into a spiritual legacy — generations of people who were believers — had a leg up on people like me from heathen families. This came at just the right moment, developmentally speaking: I was leaving behind the childhood fantasy that my parents were perfect and coming to the realization that they were actually just winging this whole parenting thing, and that they sucked at it sometimes. This is a very normal realization for a child, but at the time, it felt irrevocable and huge. Jessa offered to be my spiritual mentor, and I excitedly agreed. I may not have had a spiritual legacy from my birth parents, but I could be adopted into my pastor’s. I spent many hours in their living room, talking about my hopes and dreams. Jessa stroked her frizzy hair and told me all about the incredible destiny God had for me if I surrendered everything to Him. I clung to every word she said. Although she was not more than a few years older than me, Jessa held herself with the natural authority of a third-generation pastor’s wife, as if her every word mattered. I wanted to be just like her. “I see something special in you, Carly,” she would tell me over the bowls of chicken Alfredo she’d make us during our afternoons together. When I was with my family, I forced myself to put on “the full armor of Christ” — a Bible passage we talked about in church about spending time with unbelievers. Normal family gatherings became tense because I couldn’t let my guard down, and because I began to see my parents as my mission field — it was my job to lead them to God. “You are brainwashed,” my mother said to me once. We celebrated my dad’s birthday at the river the summer I was 16. We ate a meal of corn on the cob, cherries and grilled chicken, on a wooden picnic table a few yards from the water. We didn’t pray before eating like the people from church did, and I made a note to speak up to them about this later. I pushed the food on my plate around, sulking. I was thinking of ways I could convert them to my faith. Next to us, the river rushed constantly, filling the spaces between words. As the sun set, we played cards by lantern light. My pastors didn’t allow anyone to play cards because they said it could open doors to the Spirit of Gambling. I wanted to mention this, but I thought that it would only stir up trouble. My heart hurt thinking about what my Jacob and Jessa were up to that night. I imagined them praying together, or worshipping around a bonfire, or dissecting passages of the Bible around the dinner table. I longed to be with them. When my childhood home burned down in a forest fire the summer I was 17, my faith leaders hinted that it could have been because of my family’s generational sin. I tried to comfort myself with reassurances that God was both all-powerful and all good and that human suffering was all part of His Plan. But for the first time since I joined the church, those answers came up short. Just 10 days after the fire, I left my hometown to go to a nearby Christian university. I spent that first semester in a fog, trying to make sense of my life. I remember lying on the top bunk in my new dorm room a few weeks into my college career, wondering if my faith made sense anymore, while my roommate used our dorm phone to talk to one of the boys who wanted to date her. “That’s pretty gross, but your roommate can’t possibly be weirder than mine,” she said in a hushed voice. I held still and listened. “All she ever does is cry.” I stared and the ceiling, mortified and trying not to move as I sobbed. The next day, my Grandma brought me a box of classic Disney movies on VHS, my favorites from my childhood — Snow White and the Seven Dwarfs, Bambi, The Little Mermaid, and a dozen more. I watched Snow White on the 10-inch TV screen that somebody had donated to me, under a fort of blankets and pillows on the floor. When Snow White was over, I watched Aladdin, and then The Jungle Book. I allowed myself to be whisked away to a time before. A time before the altar calls, before the revivals, before the fire, before the fog. I hid for days in the fantasy of enchanted forests and fairy dust and singing fish, while my peers went to prayer meetings. I stopped trying to read the Bible. None of it made sense anymore. I called Jessa, hoping for a lifeline. I confided in her that God felt so far away. She asked me if I had been praying and reading the Bible enough. I told her that I often tried, but that it all felt so forced. “Why don’t you pray out loud with me right now?” she said. “Maybe later. I have to go right now.” I hung up and turned on Beauty and the Beast. A few months later, my church leaders summoned me to a humid, tiny upstairs room at church. “Carly, we need to intervene because you are backsliding,” Jessa said. She wore a scowl on her face, and my stomach filled with dread. “What’s going on? I don’t get it,” I said, stunned. I gave a pleading look to Jessa, my confidant and friend, but her eyes were cold. They told me I had the Spirit of Rebellion. They told me my heart was evil. I tried to push back, but they yelled and told me that God would abandon me if I continued to live in sin. I wish I could say I stood up for myself that night, that I ran out of the room and never came back, but the truth is I stayed. I stayed for what felt like hours, crying and letting them pray for my sins. I finally drove home in a blur, my body spent. I knew in that moment I had lost my faith. It had been slipping from me in small ways since the fire, when I no longer felt like one of God’s chosen ones, but I always thought I’d reclaim my relationship with God from the ashes. Now, I not only felt like I couldn’t trust God but also the people in my life I had given everything to. I didn’t know how I’d recover. I left the church after that night in the upstairs room, but what I didn’t know is that physically leaving was not enough. I moved on with my life without much talk about those fiery Jesus years, as if pretending they never happened made it so. It was years before I began to talk about my experiences in the church and process them for what they were: abuse. The more distance I had from the church, the more I could see how brainwashed I had been by fundamentalism. During my teenage years, I lived exactly how Jessa told me to — down to how I dressed and what music I listened to and what friends I was allowed to spend time with and how I spoke and how I approached the world. I believed that by following Jessa and Jacob, I was following God. They had the final word on salvation, eternal life and objective truth. They leveraged my normal human fear of death, and my desire for connection, as power over me. As long as I followed my leaders’ every word, I was beloved and favored, but as soon as I began to step outside of their instructions for my life, even in the subtlest ways, the same people who loved me and treated me like I was special began to verbally attack me, threaten me, and desperately cling to their waning control over me. While it hurt at the time, I now look back at their cruelty with gratitude because it was the catalyst for me to claim my freedom. I ran into an old friend from youth group while visiting my parents for Christmas, and she asked me if I attended church. No, I said, quietly, shifting my weight from one leg to the other as we stood in the produce section of my childhood grocery store. I saw sadness in her eyes. Don’t be sad for me, I wanted to say, but I didn’t. I remembered what it was like to be in that world. For years, I believed that people who walked away from their faith would suffer eternally for it. I used to judge the backsliders, and now I was one. The words of my pastors that night so many years ago had been seared into my mind: You have the Spirit of Rebellion. Today, I’m friends with many other backsliders. Most of them come from those spiritual legacy families that I used to long for. Often, they are the first to break away from generations of religiously devout people. They talk about how strained their family relationships are now that they’ve left their faith. Some of them have been disowned by their parents, while some are constantly pressured by their family members to come back to the fold, complete with warnings of impending judgment. Compared to their journeys, I had it easy. I didn’t have to risk losing family relationships for leaving the church. My rebellion was church. And now I’m more grateful than ever that that was the case. How the world’s quirkiest micro-nation got pulled into one of history’s most epic intercontinental frauds. Michael Bates was caught off guard by a newspaper item he read in late July 1997. He and his parents, a retired couple residing in the seaside county of Essex in southeastern England, were being connected to the murder of Italian fashion icon Gianni Versace. Michael, then 44, is a stocky man with close-cropped hair and a tough demeanor. He runs a business harvesting cockles, an edible mollusk found in the North Sea near where he grew up. He squinted at the paper and continued to read. It turned out that a passport issued by the Principality of Sealand, a micronation his family founded on an old naval platform, and over which Michael happens to reign as prince, was found on the houseboat where Versace’s murderer had committed suicide. The newspaper laid out the puzzling circumstances of the case. On July 15, 1997, Versace was leaving his opulent Miami Beach mansion when he was gunned down on his front steps by 27-year-old Andrew Cunanan. Allegedly distraught that a rich benefactor had cut him off, Cunanan embarked on a kill rampage across four states, murdering four people before coming back to Miami and shooting Versace for seemingly no reason. When police finally tracked him down eight days later, Cunanan led them on a chase, broke into a houseboat, and shot himself. Investigators learned that the owner of the houseboat was a German citizen named Torsten Reineck, described by some acquaintances as well-spoken and polite but by others as “obnoxious, unpleasant, disgusting.” He also owned a Las Vegas health spa where orgies allegedly took place. Reineck was a socialite who loved showing off his Sealand passport and was said to have diplomatic plates from Sealand on his car. Consequently, authorities began looking into the micronation to see what role it may have played in Versace’s murder. The Principality of Sealand, standing on two massive pillars in the roiling waters of the North Sea, was declared a sovereign nation by Michael’s father, Roy Bates, in 1967. Located in international waters and technically outside of the control of Britain, or any other nation, the country straddles a line between eccentric experiment and legal entity of uncertain definition. Authorities investigating Versace’s murder soon realized that the rulers of Sealand were not joking about their claims of sovereignty and had on many occasions taken up arms to defend their micronation. Roy Bates, along with his wife, Joan, and children, Penelope and Michael, raise the Principality of Sealand’s flag, 1967. Formerly called Roughs Tower, Sealand was one of a series of naval forts built seven miles off the coast of southeastern England during the Second World War to shoot down Nazi warplanes. The British government left the forts to the elements following the end of the war, and in the mid-1960s a group of enterprising DJs moved in and set up illegal radio stations. The BBC had a monopoly on the airwaves at the time and pirate radio was the only way to get pop music to the masses. Roy Bates, who fought with the Royal Fusiliers in World War II, and later said he “rather enjoyed the war,” was a wheeler-dealer businessman who at various points owned a chain of butcher shops, imported rubber, and sold seaweed to New York florists. One day while taking the train to work, Roy had a moment in which he realized he was done with the 9-to-5 routine; instead, he wanted to enter the pirate radio fray. Roy decided to set up his station, Radio Essex, on Knock John, one of the naval forts. The forts were a hot commodity, and violent struggles for control of them sometimes broke out between competing stations. A decorated soldier who had once had a grenade explode in his face, Roy stepped up to the occasion and resolutely defended his fort. He eventually let Michael drop out of school to help “turf off” rivals (in skirmishes that included gunfire and Molotov cocktails) and the family manhandled its his way into possession of Roughs Tower, another fort farther out at sea. Roughs Tower was at least three miles outside of Britain’s maritime boundaries, and Roy used its extraterritorial location to his advantage. His long-term intention was to turn the fort into some kind of lucrative enterprise, such as an international casino or independent television station. He declared Roughs Tower the Principality of Sealand on September 2, 1967, and installed himself as prince and his wife Joan as princess. In 1968, Michael and Roy Bates appeared in British court after firing across the bow of a Royal Navy vessel that got too close to the fort. The judge ruled that Britain’s firearms laws couldn’t be applied to structures in international waters, which the Bates family took to be confirmation of Sealand’s sovereignty. The family elected to stay at the fort after the British government green-lit commercial radio and brought pirate radio to an end, and the Principality of Sealand quickly became the foremost micronation in the world, influencing people on every continent who now claim their bedroom, neighborhood or disputed territory as a country of their own. Although they no longer live there, the Bates family has continued its hold on the fort until the present day, successfully upending Crown plots to blow up the platform, warding off more attempts at invasion, and winning bureaucratic victories, such as the time the British government ruled that Roy didn’t have to pay into the national health care system while he lived at the fort. As they built up the reputation of the concrete-and-metal statelet, the family issued coins, stamps and other trappings of statehood, including passports. The Sealanders had issued around 300 of them over the years, but only to trusted compatriots, and certainly not, Michael Bates was sure, to anyone who would commit cold-blooded murder. His head was spinning when he finished the article. Authorities would soon determine that the Bates family had nothing to do with Versace’s murder, but as it turned out, this was just the beginning of a series of problems involving bootleg Sealandic documents. The family didn’t realize just how successful they’d been at asserting Sealand’s statehood, and now the tiny nation was being used to facilitate a series of wild scams all over the world. On April 4, 2000, a trim, handsome 46-year-old man named Francisco Trujillo Ruiz made a few adjustments to the odds and ends in his office at 210 Paseo de la Castellana, a street in a fashionable part of Madrid, before sitting down to speak with a newspaper reporter. Trujillo Ruiz, a flamenco club owner and former police officer who’d been kicked off the force for burglarizing a home, was going to talk to the journalist about his duties as a high-level government official. The reporter had just turned on her recorder and had her pen poised above her notepad when a klatch of green-uniformed members of Spain’s Guardia Civil came through the office’s door. Trujillo Ruiz jumped up in surprise, and the officers promptly made their way around desks and chairs to where he was standing, boxing him in. He was under arrest, they announced, for allegedly selling more than 2 million gallons of diluted gasoline. Trujillo Ruiz was momentarily nonplussed, but as the police closed in, he pulled out a diplomatic passport and claimed immunity. The police had no right to be there, he said, as they were actually on territory belonging to another country — his office was the Sealandic consulate in Spain. One of the gang’s primary sources of income was the online sale of Sealandic passports, nationality cards, and degrees from universities supposedly based on the Principality of Sealand. Customers could shell out between $9,000 and $55,000, depending on what document was needed, and they were free to use them for whatever purposes they wanted. Not long after Trujillo’s arrest, officers crashed two more Sealandic “embassies” in Madrid, one of them located in an office that managed bingo halls. At least 20 fake diplomatic passports, hundreds more blank passports, and 2,000 official documents were seized in the raids, as were two vehicles with Sealand diplomatic license plates that had been escorted through Madrid by Spanish police on more than one occasion. Sealand’s true prince, Michael Bates, was tipped off to these strange goings-on around the same time, when a friend asked him about the documents for sale through the Sealand website. While the Versace incident in 1997 had alarmed them, the Bates family had been oblivious to the extent of the problem with Sealand passports. “Excuse me?” Michael said to his friend. Michael scratched his chin. Sealand did have a website, but it was in its infancy. And it certainly wasn’t selling official paperwork. He turned on his computer, clicked on the browser icon, and listened to the dial-up connection’s rasp. He typed in Sealand’s then-URL: www.fruitsofthesea.demon.co.uk/Sealand. The site was how he had left it. He then searched around and turned up a Sealand site with a much more manageable domain name: www.principality-sealand.net. Lo and behold, it was a website purporting to be the official mouthpiece of Sealand, and one could indeed buy a number of Sealandic documents. Spanish investigators unraveled the web and found that the scams associated with the fake Sealand paperwork involved more than 80 people from all over world. The scams were impressively wide-ranging: one “itinerant ambassador” used bootleg Sealandic documents in an attempt to acquire 1,600 cars and secure a €20 million loan to buy two private planes. Sealandic credentials were sold to Moroccan hash smugglers, and the gang reportedly sold more than 4,000 passports in Hong Kong for $1,000 apiece. “We were completely shocked with the information and papers he showed us. We knew nothing at all about it or the people involved. It was all news to us,” Michael recalled. Even more incredibly, the gang’s leadership had begun negotiating with members of the Russian mafia to buy tanks, helicopters, bombs, missiles and ammunition, through a shell company set up with bootleg Sealandic documents. They intended to sell the arms to Sudan, which was under embargo by many governments of the world for being a terrorist state. “They’re stealing our name, and they’re stealing from other people. How disgusting can you get?” Princess Joan told the Los Angeles Times. Trujillo Ruiz reportedly first learned about Sealand while working in Germany for a man named Friedbert Ley, who had launched his own Sealand fan website in 1998 and asked Trujillo Ruiz to set up a Spanish branch office of the Sealandic government. When confronted by investigators about the fake passports, Trujillo Ruiz conceded that they were made in Germany but said he had been appointed acting head of state by the royal family of Sealand and been given authorization to issue Sealandic passports. Meanwhile, Trujillo Ruiz’s father, who shares the same name, told a reporter that it was bad fortune that he had passed his name on to such a numskull. The investigation into his son’s criminal activities resulted in his father’s bank account being frozen, and his overall good-for-nothingness also contributed to his parents’ divorce. The Germans had once visited the younger Trujillo Ruiz in Spain, and they appeared to be a bad influence on him, the father said. That was a significant understatement, considering that the individuals connected to the passport scams were also connected to Sealand’s shadowy, kidnapping-prone government-in-exile. In the early 1970s, Roy Bates had prepared to turn the fort into a much larger ministate with a group of Belgians and Germans who had offered to go into business with him. The Germans were led by Alexander Gottfried Achenbach, said to be a former diamond dealer who was planning on a quiet retirement raising rabbits in Belgium until the Sealand opportunity sucked him back in. It was the “last great adventure of the 20th century,” said Achenbach, who would eventually become, among many other titles, Sealand’s minister of foreign affairs. The Germans were remarkable busybodies, drawing up a constitution and legal decrees and bombarding embassies all over the world with requests for diplomatic recognition. The baffled recipients sent cables to the British government asking what was going on, and the Crown’s exasperation is evident in their replies that it was probably best just to ignore the Sealanders. In August 1978, Roy and Joan Bates drove to Salzburg, Austria, to meet Achenbach and company to finalize some of their plans. Back in Sealand, however, Michael was working on the fort alone when a helicopter landed. Out came some of their German associates, who claimed Roy had given them possession of the fort. Michael was extremely uneasy about the situation — and completely outnumbered. Roy and Joan were similarly uneasy when a friend back in England alerted them that he had seen a helicopter hovering near Sealand. Their sinking feeling was justified. By this point, Michael had been beaten up and locked in a room during a takeover orchestrated by Achenbach and overseen by a 34-year-old lawyer named Gernot Pütz. “Tie him up,” Pütz said when he arrived at the fort. Michael tried to wrench himself free, his hair falling in his eyes as he was dragged into the room and shut behind a steel door. Sealanders keeping guard after the invasion of 1978. Gernot Pütz, seen behind the armed man, was held on treason charges for his role in the invasion. The only possible way out was a porthole window, but it was far too small for an adult to fit through. Michael was left in the room for three days, keeping himself warm by wrapping himself in a Sealandic flag. Eventually, the captors threw Michael onto a boat, which deposited him in the Netherlands, with no money and no passport. A sympathetic skipper helped him get back to England, where he linked back up with his parents. The reception wasn’t necessarily warm. “How can you throw away our life’s work?” his mother asked him in tears. “What have you done since you’ve gotten back to resolve the situation?” Roy thundered. But Michael explained his ordeal. “To this day I can’t sit with my back to a door or a room full of people,” he writes in his memoir, Principality of Sealand: Holding the Fort. The family quickly decided that the only possible response was to recapture the fort. They gathered some rough-and-tumble friends and a few guns, and enlisted the talents of a pilot friend who had flown helicopters in a James Bond film. The plan was to fly to the fort, rappel down ropes, and retake the Principality by force. Attacking at dawn, they descended from the sky, fired a single shot from a sawed-off shotgun, and tossed the captors into the brig. “We coup de état’d the coup d’état,” Michael proudly told reporters who sailed out to the fort. “You don’t serve seven years in the Army without learning something,” Roy added. A tribunal was established to try the invaders. The other conspirators were freed, but because Pütz was a Sealandic national, his actions were considered traitorous and he was held prisoner, fined 75,000 deutsche marks, and made to wash toilets and make coffee. Britain shrugged its shoulders when asked to intervene, saying the fort was not on its property. The diplomatic crisis ultimately became so serious that, as Michael describes it, a “sallow-complexioned and cadaverous man” from the embassy of the Federal Republic of Germany named Dr. Neimoller came to negotiate the prisoners’ release. Pütz was freed six weeks after he was captured, and the Sealanders counted the direct engagement with a foreign government as another formal action that affirmed Sealand’s sovereignty. The Germans retreated back home after the failed coup and established the Sealandic government-in-exile, a dark mirror version of the Principality that persists to the present day. The government-in-exile disavowed any role in the late 1990s Spanish passport scam. In a press release denying involvement, Minister for Special Affairs Hans-Jürgen Sauerbrey also alleged that, instead of investigating the real criminals, German authorities had searched the diplomatic and trade missions of the exile government because they were looking for Nazi documents, information about flying saucers, caches of silver and gold, and a “multitude of cultural goods of immeasurable value … as well as highly sensitive documents from the Stasi files” that the exile government possessed. Despite Sauerbrey’s disquisition, investigators noted that the circumstantial evidence linking the Germans to the scam was pretty strong. Torsten Reineck, who owned the houseboat where Versace’s murderer turned up dead, was linked to the same Germans who worked with Trujillo Ruiz, and these Germans all lead back to Alexander Achenbach, former prime minister of the government-in-exile and the man who attempted the coup of Sealand in 1978. In the mid-1990s, Achenbach set up a company called the Sealand Trade Development Authority Limited (STDAL) through the infamous Panamanian law firm Mossack Fonseca, said to be one of the world’s top creators of shell companies. According to information revealed in the Panama Papers leak of 2016, STDAL was set up in the Bahamas using a Sealandic passport and envelopes bearing Sealandic stamps. Similarly, Achenbach and an Austrian couple named Josef and Eva Baier opened a bank account at Banka Koper in Slovenia in 1996. They caught the attention of Slovenian authorities when €6 million suddenly appeared in the account in March 1997. Officials expected that the money was from laundering, organized crime and/or a pyramid scheme. Not long afterward, the Baiers came to Banka Koper and withdrew €200,000 from the account, again using Sealandic documents. When the couple attempted to withdraw €4 million more, the bank gave them a smaller amount and sent them on their way. They were arrested when they tried to cross into Italy. Slovenia had long since put a hold on Achenbach’s account, touching off an eight-year legal battle between Achenbach and the Slovenian state, who struggled to prove that the money had come from an illegal source. Ultimately, the Koper District Court ruled that Banka Koper had to release the €6 million to Achenbach because they couldn’t prove it was related to any criminal racket. The money had in fact come from a gambling enterprise in Poland, but it was an aboveboard operation. A higher court later affirmed the ruling in Achenbach’s favor. Achenbach had the money transferred to an account in the name of his lawyer; he couldn’t use his own bank account, as it too had been opened with fake documents. Achenbach sued Slovenia in 2010 for preventing access to his money, asking for €1.3 million in compensation for the difficulty the government had caused him over the past eight years. Achenbach was 79 when he filed the lawsuit in 2010, and he succumbed to old age in the middle of the litigation at age 80. The strange legal and financial quagmire was a fitting final chapter in the life of someone who had spent his whole life involved in dubious ways to get money. Prince Roy and Princess Joan passed into the next realm in 2012 and 2016, respectively, but the country is going strong more than five decades after it was founded. “We’ve been a country longer than Dubai’s been in existence,” Michael pointed out in the BBC podcast. Michael takes only intermittent trips out to the fort these days, but Sealand is always occupied by at least one armed caretaker, lest any of the events of its bellicose history repeat themselves. The government-in-exile is still going strong as well, led by Prime Minister Johannes W.F. Seiger since a constitutional amendment transferred power from Achenbach in 1988. The group has become even more bizarre and sketchy under Seiger’s reign; its philosophies are driven by UFO-infused Aryan mysticism and the quest to harness a Force-like energy called Vril. Seiger has been investigated for numerous shady financial and land dealings over the years, and he has been suing to get back the nuclear and chemical weapons entrusted to his safekeeping that the “illegitimate” German government took from him. Seiger asked this writer if I could put him in touch with Donald Trump to help him with his quest, canceling further contact when I was unable to do so. All in all, despite the genuine headaches that came with criminals trafficking on the Principality’s name, the saga makes for a chapter in Sealand’s history no less eventful than those of any of its macronational neighbors. This article has been adapted from a chapter in the author’s forthcoming book about the history of Sealand, which will be published by Diversion Books in early 2020. Fifty years ago, John Trudell overcame tragedy to become the national voice for Native Americans—and a model for a new generation of activists. He sat at the same table each evening, sometimes with lighting and sometimes without, a cigarette often in hand, a guest always by his side. In the background, the sound of waves rolling against the rocks and the stuttering of a backup generator were constants. Then, with a crackly yet true radio connection, streaming through the wires from an unthinkable place — Alcatraz Island — he began speaking in a calm, determined voice. The nation was listening. In the Pacifica Radio Archives, located in a modest brick building in North Hollywood, you can hear what hundreds of thousands of Americans heard on those evenings. File through the cassettes and you will find more than a dozen tapes labeled with a single word: Alcatraz. Each is followed by a date, anywhere from December 1969 to August 1970. But these were not simply programs about Alcatraz, that island in the notoriously frigid San Francisco Bay that was home to a federal prison until it closed in 1963. Rather, they were broadcast from the former prison building itself, from a small cell without heat and only a lone generator for power rumbling in the background. The show was called Radio Free Alcatraz, and it was hosted by John Trudell, a Santee Sioux Native American activist and broadcaster. By the winter of 1969, Trudell could be found in that austere cell, speaking over the rush of waves in a composed Midwestern accent. And by 1973, he had become one of the FBI’s most feared activists, with a file that would eventually run longer than 1,000 pages. Why would the FBI compose its longest dossier about a broadcaster speaking from a rocky island a mile offshore? What was Trudell saying that frightened them so much? And for the first time, non–Native American communities were listening. More than 100,000 people tuned in to Pacifica stations in California, Texas and New York to hear his weekly broadcast. At just 23 years old, with long brown hair and hanging earrings, Trudell had one thing the FBI could not stop: his voice. In this excerpt from Radio Free Alcatraz, John Trudell documents the government’s brazen violations of Native American rights and explains what changes are necessary before honest negotiations can begin. Trudell’s story begins in the autumn of 1969, when a group of Native American activists, known as the Indians of All Tribes (IOAT), began contesting centuries of injustice by seeking to reclaim unoccupied lands. The organization pointed to the 1868 Treaty of Fort Laramie, which provided that all surplus federal land be returned to native tribes. IOAT set its eyes on Alcatraz, a symbolic beacon just past the Golden Gate Bridge. It had been unoccupied since President Kennedy closed the federal prison in 1963. By inhabiting the 12 acres of Alcatraz, IOAT hoped to set a precedent for the reclamation of hundreds of thousands of unclaimed acres across the United States. But there was an obstacle: a hawkish government. Each time IOAT tried to reach Alcatraz — even making attempts to swim — the Coast Guard blocked their passage. That all changed on the night of November 20. Under the cover of darkness and a dense blanket of fog, 79 activists from more than 20 tribes sailed from Sausalito across the frigid bay and settled on the island. Over Coast Guard radio, the sole caretaker of Alcatraz could be heard shouting, “Mayday, Mayday. The Indians have landed!” Despite his calls, the government’s response was delayed; the activists, many with their families and children, were safe. A gathering was held that night at 2 a.m., the old prison barracks were set up as homes, and food was lifted in fishing nets. Governing teams were also established. Onshore allies knew the landing had succeeded when they saw a bright yellow Morse code message blinking through the mist: “Go Indians!” Back on Alcatraz, the children of the activists shrieked with excitement and clambered around the precipices of their new home. John Trudell was not on those initial voyages. At the time, he had just returned from deployment in Vietnam, enrolled in San Bernardino Valley College, and moved in with his girlfriend, Fenicia Lou Ordonez. When he learned of the landing on Alcatraz, he suggested they join in. “I get cold feet,” Fenicia protested, according to a scene in director Heather Rae’s 2005 documentary Trudell. “Well, you’ll have to find socks,” said Trudell. Expecting to join for only a few weeks, they packed sleeping bags, headed six hours north, and hitched a ride across the emerald bay on one of the IOAT-operated vessels, many of which were typically used for fishing and shipping. What was once a treacherous journey with fierce Coast Guard resistance was now readily accessible, but not because the government had become any more benevolent. Rather, the activists’ tactic of establishing a critical mass on the island, and showing the nation why it was deservedly theirs, had succeeded. Fearing a public backlash, federal authorities called off the Coast Guard from intervening in these voyages. Soon after docking on the island, Trudell attended the daily island meeting of IOAT leaders and tribal heads. He pointed out that if they truly wanted to make a case for the Native American right to reclaim unused land, they urgently needed to reshape the narrative. On his drive to the Bay Area, Trudell had seen national papers like The New York Times and San Francisco Chronicle running stories portraying the occupation as a Native American theft — rather than a reclamation of what was stolen from them. His answer would take the occupiers’ message across the country and change the way Americans thought about the injustices perpetrated against native peoples. If you lived in Northern California and tuned into KPFA-FM at 7:15 p.m. on December 22, 1969, or if you lived in New York City and tuned to WBAI-FM at 10:15 p.m., you would not get standard national news or updates about the moon landing. The song was followed by an announcement. For the next 30 minutes, Trudell led conversations with Native American activists, spiritualists and students — many of whom were living on the island, visiting as volunteers, or ferrying supplies. It was called Radio Free Alcatraz, and Trudell typically began episodes by describing challenges on the island. There were many: Alcatraz had shaky electricity, a dearth of clean water, and it was frequently hit by strong offshore storms. Despite these immediate challenges, Trudell — often clad in a wide-collared button-down underneath an emblazoned leather jacket — spoke both with the equanimity of a captain reporting to headquarters and the kindness of a good friend. In an interview with KPFA host Al Silbowitz in December 1969, Trudell sketched a portrait of life on the island and outlined the purpose of the occupation. While many watching from the shore had been amazed by the movement’s courage and ability to survive on the rocky island, Trudell wanted the non–Native American audience to know: This struggle was not unique to this moment. It was experienced daily by native tribes everywhere. More often than not, however, Trudell’s primary role was not that of orator but rather of generous mediator, determined to animate Native American voices and convey a sense of hope born from their struggle. The heart of the program was his intimate voice — masterful at revealing the aspirational humanity that defined the movement, while outlining the enduring goal of activists to construct a university and Native American cultural center. Trudell was not just a broadcaster: He was one of the unsung American forefathers of what we now call socially impactful publicity, or strategic communications. He already knew that for activists to succeed, it was not enough to campaign. They had to shape national consciousness. Jonny raised concerns about the unjust allocation of federal funds to her reservation and revealed the low wages factory workers were receiving at a firearm production plant there. As an activist, Trudell’s role was often that of raconteur. He didn’t just tell about injustice. He relayed stories that showed it, and he had faith that Americans everywhere, having heard these stories, would do the right thing. On January 5, 1970, just six weeks into the occupation, the 13-year-old daughter of Richard Oakes, one of the movement’s founders, fell to her death from a third-story window. Oakes, in immense grief, left the island. The child’s death, and his departure, were a blow to a community that was becoming increasingly disorderly and plagued by internal strife, as rumors mounted that the U.S. Marshals might raid the island at any time. But Trudell did not falter. Tragedy was not new to Trudell. It was a foundational part of his family history. In the early 1900s, Trudell’s grandmother had been kidnapped by Pancho Villa’s men from her tribe in Chihuahua, Mexico, and brought to the U.S. She eventually settled down in Kansas with Trudell’s grandfather, a man with a price on his head for his involvement in the Mexican Revolution. A few years later, the couple had a daughter, who, after moving to Nebraska, fell in love with a Santee Sioux native, Clifford Trudell. The couple married and had John, born in a hospital close to the reservation in Omaha, on February 15, 1946. John grew up on and around the Santee reservation in North Dakota. Life felt wholesome; the reservation offered respite from the civil commotion and disarray that characterized U.S. cities, while providing sources of ritual and community. But those rather innocent early years ended abruptly at the age of 6, when Trudell’s mother died in childbirth. He paused, and spoke again, his still-powerful voice as soft and singsongy as a child’s. In the early 1950s, John enrolled in school off the reservation, where he confronted a Western culture indifferent to his spiritual understandings and offering few answers to his enduring questions. He often asked, literally, “Where had my mother gone?” He learned about the Christian God and heaven from classmates and teachers. But these concepts never resonated with him. How could he trust a religion that was upheld by a culture that was threatening the lives of his tribe and Native American people everywhere? “You have potential,” Trudell heard one day in the principal’s office. “But you have to work harder if you want to be something.” Trudell didn’t care for the patronizing tone, and he knew he already was something. He longed to escape a school that seemed to stifle, not teach. He soon found a way, enlisting in the Navy during the early days of the Vietnam War. He spent his deployment far from the jungle battlefields, bobbing in the waters off of Saigon, watching the stunning kaleidoscopic sunsets and meditating on the fate of his people. In 1971, the occupation was more than a year old, and the federal government began plotting to end it. In late May, they shut off electricity and cut off all radio service on the island, ending Trudell’s broadcasts. The population on the island plummeted as water became increasingly difficult to access. Meanwhile, factions and power struggles began emerging within the occupiers; some wanted to hire an attorney to represent their claims. Others, including Trudell, believed self-representation was the only honest way forward. When government agents raided Alcatraz on June 11, there were only 15 people remaining on the island. It is unknown whether Trudell was among them, but one thing was clear: Though the occupation was officially finished, Trudell was just getting started. His next fight would be with the FBI. “He’s extremely eloquent, and therefore extremely dangerous,” reads a line in Trudell’s FBI dossier. They had no idea that the even greater danger lay in a deeper kind of power: his power to reveal inequality and injustice while appealing to natural liberty. After the occupation, Trudell became the chairman and national spokesperson of the American Indian Movement (AIM) and fell in love with a prominent Native American activist, Tina Manning. They married in 1972 and often traveled and gave speeches together. Meanwhile, Trudell galvanized AIM through protests, most notably the 1973 campaign to reclaim Wounded Knee village from tribal chairman Richard Wilson, who was notorious for suppressing political opponents and failing to act in the best interests of the reservation. Trudell’s oratory prowess transformed the grassroots movement into a national effort. But this time, he used it not to communicate to outsiders, but rather to organize disparate tribes. It worked. Thousands of activists gathered at Wounded Knee, the site of a massacre of Native Americans by U.S. Calvary in 1890, which now had symbolic power. The FBI and federal marshals soon moved in. Clashes were deadly. But Trudell was a pacifist at heart — one of his common rhetorical refrains in the 1970s was, “The natural world has a right to existence, and we are only a small part of it” — but growing injustices against native tribes in the 1970s pushed him to the brink. In 1975, he was arrested for assault after entering a reservation trading post to obtain food for senior residents. And on February 11, 1979, as part of a protest against the Bureau of Indian Affairs, he burned the U.S. flag outside the J. Edgar Hoover Building. His intentions had been peaceful — “I burned the American flag as an act of protest against the injustice being extended against all of the people,” he said — but his message was lost on the national media, which leaned on racist tropes about disgruntled Native Americans in reporting the story. The next night, Tina Manning Trudell was asleep at home with their three children on the Duck Valley Indian Reservation in Nevada. She awoke to the smell of smoke and a pounding on the door. Fire filled the house. It was too late to run. Tina, who was pregnant with a boy they intended to name Josiah Hawk, perished, as did all three of their young children — Ricardo Starr, Sunshine Karma and Eli Changing Sun. From the time that his mother died in 1951 to his first days on Alcatraz, Trudell had turned to language — orations, poetry, rhetoric — as an existential stabilizer, a spiritual compass. But this time was different. He had no words, and he was left only with angry suspicions — suspicions that the FBI had caused the fire, suspicions that they were now on the hunt for him. He disappeared from the national scene and drove, crisscrossing America, alone in despair. If you walked into a record store in 1983, you’d have seen an LP with JOHN TRUDELL sketched in blood red across the top, and beneath it, a black bald eagle, a dream catcher wrapped around its neck. Produced by Jackson Browne and entitled Tribal Voice, it was the product of years of grieving, mourning, and, eventually, finding the words for his pain, for his hope. Long before slam-poetry songwriting became popular, Trudell wrote an album that mixed his love for poetic rhythm with his devotion to justice. He wrote much of it while on the road in the early 1980s, a cigarette between his fingers, a cup of coffee by his side, and a journal on his lap, during a period when he made very few public appearances. The lyrics on Tribal Voice reflect that nomadic lifestyle — dynamic, alive, quaking with power — and they at once inspire us to move our bodies, while also attuning us to the earth, to our connection with the earth. In lines like “natural beauty to last beyond oppressors’ brutality,” Trudell speaks to his enduring hope: that language, well told and viscerally felt, can carry the seeds of justice, and transmit them to activists, citizens, migrants, parents and children everywhere. Few heard the album at the time of its release, but those who did — including Bob Dylan — praised it for its brilliance, and for its urgency about raising American political consciousness. Throughout the 1980s and ’90s, and into the early 2000s, Trudell continued to release albums, publish books of poetry, and deliver speeches throughout the United States. But the years of tragedy in the 1970s, including the death of his wife and children, remained deeply with him, and he would never return to the central activist role he once held — perhaps one of the reasons that, of all of the activists of the late 20th century, he is one of the least known to us today. Death, for Trudell, was not the end. It was nothing more and nothing less than a ride … a journey back to his origins — the collective human origins he forever encouraged us to remember — of Mother Earth. His voice, one hopes, will continue to drift in swells across the San Francisco Bay, spreading throughout the nation, where it deserves, as urgently today as ever, our embrace. She was imprisoned for murdering her husband, then escaped and assumed a new identity. Her adoring friends and employers had no idea. Carliner’s eyes widened as she scanned the photos accompanying the article. Her husband looked over, confused. Carliner showed him the layout, which included five snapshots of a middle-aged black woman looking radiant in various settings. There she was smiling, surrounded by friends in one image, resplendent in a wedding gown in the next. The woman was Joan Davis, 54, a kindly and beloved former family employee. In the 1960s, when Debbie Carliner was a teenager and her mother decided to go back to work, her parents had hired Joan to make the beds and help with the cleaning. Joan was an excellent worker, and she was warm and unfailingly trustworthy — so much so that when they left on family trips, the Carliners asked her to watch after their home in Chevy Chase, Maryland. Debbie’s mother had often said that Joan was highly intelligent — “too smart to be a maid” was how she put it. All of which made reading the story that much more bewildering. The article reported that Joan’s real name was Jannie Duncan. And that was hardly the only revelation: In 1956, Jannie had been arrested for the murder of her husband, Orell Duncan, whose savagely beaten naked body had been buried in a shallow grave near Richmond, Virginia, the story said. She stood trial, was found guilty of murder, and sentenced to 15 years to life in prison. After a few years, she was transferred to St. Elizabeths Hospital, a mental institution in Washington. That’s when the story went from shocking to surreal. In November 1962, Jannie had walked off the hospital grounds and vanished for more than 12 years. After she was finally arrested again, on January 2, 1975, the story that emerged was as straightforward as it was unbelievable: She seemed to have simply melted into the streets of Washington, mere miles from the hospital, taken on a new name, and plunged into a new life. I stumbled across the story of Joan/Jannie earlier this year while researching politics in the 1970s. I was so fascinated that I spontaneously abandoned what I was doing to look for other articles about her. The more I found, the stranger and more interesting the story became. For example, she told authorities that she couldn’t remember anything of her life from before she was Joan Davis — but she believed she had been kidnapped from the mental hospital. The more I found out about her in the weeks that followed, the more I became consumed by a question: What was the truth about Jannie Duncan? Her twin narratives diverged so sharply that there seemed to be only two possibilities: She’d been railroaded on a murder charge and slipped free of a punishment she didn’t deserve. Or she had killed her husband, escaped, and fooled everyone, cleverly concealing her status as a fugitive who had engineered a great escape. She was a model citizen who had been wronged, or she was a con artist. I decided to find out which. The woman the Carliners knew as Joan Davis was born Jane Waller on February 9, 1920, in Gravel Hill, Virginia, a tiny unincorporated community outside of Richmond. Public records indicate that she was the fourth of seven children. She dropped out of high school after the 11th grade, and, after turning 19, married Thomas Bowman, her hometown sweetheart. The marriage was likely an act of heedless teenage passion. She left her husband after a few months, lighting out for Washington. There she worked as a clerk and maid during the day and plunged into the city’s boisterous nightclub scene by night, according to the Post. The divorce became official a few years later when Jane, whose friends called her Jannie, married a comedian named Telfair Washington in 1944. He died of a heart attack in 1946. Jannie took over Washington’s 17-room tourist home (essentially a boarding house) at 1622 7th Street NW. In 1950, she married again, this time to a gambler named James Terry. She divorced him about two years later, but the turbulence in her personal life didn’t seem to inhibit her business acumen. Within a few years, she employed a handful of people and owned a full-length mink coat and a 1955 powder-blue two-tone Cadillac Fleetwood. In 1954, she met Orell Duncan, 37, a member of a gambling syndicate run by kingpin Henry “Piggy” Leake. In 1952, Orell Duncan had been arrested and convicted of operating a lottery and possession of number slips. Jannie married him in March 1955, but within a few months, they were living at different addresses. There are conflicting accounts of what happened while she was working at the boarding house on 7th Street during the early-morning hours of March 11, 1956. What’s clear from court records and newspaper reports is that Orell turned up around 12:30 a.m. and a confrontation took place, and she pulled a gun on him. Orell disarmed her and again began struggling with her. Two of Jannie’s friends, Edward James and Calvin Simms, joined the fray on her behalf. Orell was later found dead from multiple contusions to the head. Within a span of three days, police in Virginia and Washington arrested Jannie Duncan, James and Simms, and introduced a motive: Jannie’s estranged husband was snitching on her to the IRS. That detail became a staple in newspaper reports about the killing. She was charged with first-degree murder, which carried a mandatory death penalty. At the trial that autumn, the government’s star witness, 25-year-old Carl Winchester, a friend of one of Jannie’s employees, testified that Jannie had pointed a gun at Orell and pulled the trigger several times, but it never fired. The crux of the trial centered around the post-fight drive in Jannie’s Cadillac. The prosecution claimed that the three defendants finished him off in the car, while Jannie and the others testified that they were talking calmly when the men began arguing and struggling with Orell, and he fell out of the car and died from his injuries. After a full day of deliberation, the jury found Jannie and James guilty of second-degree murder. Simms was convicted of manslaughter. Her incarceration at Occoquan women’s prison initially passed without incident. One then-inmate later told the Post that Jannie was quiet and tidy and kept to herself, studying law books. After three and a half years, on November 14, 1960, Jannie was moved to St. Elizabeths. Almost exactly two years later, she walked off the grounds and vanished. Over time, I assembled the jigsaw puzzle that was her life. Once out of St. Elizabeths, Jannie began quietly reinventing herself. She replied to a classified ad in the newspaper for a job as a domestic helper in Potomac, Maryland, then procured a driver’s license and Social Security card under the name Joan Davis. She spent about two years working for that family, according to newspaper accounts. Jannie never left the Washington area, except for the year she spent in Detroit with her new husband, Wilbert Lassiter, a Michigan native whom she married in 1972. Eight of her friends flew from Washington to attend the wedding. The Lassiters returned to the nation’s capital a year later. In September 1963, about 10 months after Jannie’s escape, the FBI, frustrated in its attempts to find her, had issued a wanted poster: “Duncan is an escapee from a mental institution. participated in a vicious assault which resulted in victim’s death. Considered dangerous.” The document shows all 10 of her fingerprints and her mugshot. In the photo, her face is tilted just to the right, her mouth slightly downturned; her hair is closely cropped and forms a little wave on the right side of her head. She is listed as 5-foot-6 and 150 pounds. But cracks eventually began to show in the foundation of her immaculately rebuilt life. She and Wilbert Lassiter separated around May 1974. By December 1974, he had taken up with another woman named Jannie — Jannie Dodd, according to the Post. That month, Dodd complained to the police that Joan Lassiter had made threatening phone calls and left menacing messages at her house. One such note, Dodd said, read: “Have a merry Christmas. This will be your last.” Dodd filed harassment charges. That infamous offense came to light in a remarkable way. Police in Arlington, Virginia, arrested Joan Lassiter on the harassment charge on December 31, 1974. She was fingerprinted, processed, and sent home. As her paperwork was being filed — the sets of prints placed among about 310,000 others — a clerk noticed something surprising: The fingerprints of Joan Lassiter, housewife, perfectly matched the prints on the FBI wanted poster for Jannie W. Duncan, escaped murderer. On January 2, FBI agent Stanley Niemala drove to Magnolia Gardens, the apartment complex in Arlington where Jannie Duncan lived. She was a convicted murderer on the lam, so he brought along two other agents as backup. They watched the building for a while, and when a light popped on in her second-floor two-bedroom unit, they moved upstairs. When Agent Niemala told Jannie that she was under arrest, she “kind of froze,” he says. He saw astonishment in her expression; after 12 years of freedom, she clearly hadn’t expected to hear the name Jannie Duncan again. “When you’re out that long and somebody suddenly steps up and puts cuffs on you, it’s not easy,” he says. The other two agents each took a shoulder, gently lifting her, for the walk to the car. She was still so immobilized that when they reached the FBI office in Alexandria, Niemala brought the fingerprinting equipment to the car rather than haul her up to the third floor where she would normally have been processed. Then Jannie Duncan was returned to St. Elizabeths Hospital. After about three weeks of evaluation, officials there declared that she had no mental issues and shipped her back to prison. Con men and women have been around for at least as long as humans have traded currency, and everyone who has received emails from a Nigerian prince promising a share of his just-out-of-reach fortune knows they’re still thriving. As I learned more about Jannie, I began to view her exploits more cynically. Several elements of her story fed into this. The threats leveled by Jannie in 1974 suggested that “Joan Davis” was invented to help perpetuate her escape. Those menacing notes offered evidence of her old, true self leaking out. When I contacted St. Elizabeths, a spokeswoman told me she was permitted only to confirm the dates that Jannie entered and left the facility. The law prohibited her from discussing Jannie’s diagnosis or care. But the Post passage suggested the possibility that Jannie had planned the whole thing: She had engineered the transfer not because it would be easier to be paroled, but because it would be easier to escape. I felt I had a firm handle on Jannie’s exploits by the time I scored my most significant research breakthrough. After calling the federal courthouse in Washington to ask about her murder trial, I learned that the case file is stored in the National Archives. I drove to Washington to see what I might learn. In the research room, I flipped open the first box, which contained the first few hundred pages of a 3,000-page trial transcript on thin onion-skin-type paper. Though I would eventually read everything, I jumped straight to Jannie’s testimony. She testified that a month into their marriage, he came home from a night of partying and “started beating me and picking me up and throwing me back down on the bed and knocking me about,” she said. “He finally knocked me on a table that was sitting beside the bed and it cut me up here with my eye.” She fled to the bathroom and called her mother-in-law, who took her to the hospital. Jannie soon moved out but didn’t divorce Orell, and in May 1955 they were in a bar and he wanted to leave just after she’d put a quarter in a jukebox. When she said she wanted to hear the music, he began “striking her about the head.” She fled, but he jumped in their car just after her, pushing her into the passenger seat. After driving a short distance, he reached over, opened her door and pushed her out, then exited and began hitting her while she was on the ground. She escaped that situation, but another time he threatened to stab her to death. She made several hospital visits. At Freedmen’s Hospital, the staff closed a laceration on her left arm with eight stitches; at Farragut, she was treated for a one-inch laceration over the right eye, abrasions on her legs, and multiple contusions to the head. She had gone to the bedroom and retrieved the handgun she’d taken from him a month earlier. She held it on him as he walked into the kitchen, then she gave the gun to an employee while she called Edward James. A few minutes later, James and Simms arrived. Carl Winchester was the key witness against Jannie. In his testimony, he said Orell reached for the gun and struck Jannie — “he lunged at her and almost knocked her down” — when she pulled the trigger. But the employee had removed the bullets when she called James. James and Simms began scuffling with Orell, but eventually they stopped. Several bystanders broke up the altercation, and the four of them cooled down, settling into a temporary détente. Orell asked Jannie to give him a ride home, and she agreed on the condition that the two other men came along. They headed outside and climbed into Jannie’s car, witnesses said. Smithson also questioned whether Orell was capable of beating Jannie in the ways she described, noting that he only weighed marginally more. He wanted the jury to ignore Orell’s obvious physiological advantages—and that in some cases he was wielding weapons. I was also struck by another aspect of the transcript: It raised serious questions about Jannie’s purported motive for killing Orell. She clearly had issues with the IRS; court records showed that she owed $26,369 in back taxes. But she testified that she’d been on the agency’s radar for years, and her lawyer, James Laughlin, argued vehemently for permission to introduce evidence that “would show an investigation was underway long prior to her marriage or contact with Orell Duncan.” Laughlin, in fact, had represented her during the IRS proceedings. Independent proof suggests that this was almost certainly true. On April 4, 1956, a few weeks after Orell’s death, the IRS ran a classified ad in the Evening Star announcing an auction for Jannie’s mink coat to recoup unpaid taxes. The IRS typically auctions off property only after expending significant effort, often over the course of several years, to extract back taxes. But Judge Joseph McGarraghy refused to allow testimony or evidence about Jannie’s IRS history, and the jury apparently accepted the contention — introduced by the police within days of Orell’s death, repeated frequently in newspapers, and advanced by the prosecution — that Jannie was furious at Orell for snitching. In light of all of this information, it was jarring to see her story so casually dismissed. It was as if the alleged abuse didn’t matter — like it couldn’t possibly have been a factor, even in a crime of passion like Orell’s killing. But even a casual reading of recent American history reveals that none of it is particularly surprising. The idea that a black woman’s version of events would be ignored in a trial in the 1950s, and that the word of the police and a white prosecutor would prevail: Of everything about this strange story, that was the shortest leap of all. Viewed through the lens of the trial transcript and the information the jury never heard, everything about Jannie’s story looks different. Orell died from a result of Jannie’s acts of self-defense during a series of drunken brawls. He could easily have killed her, and probably would have eventually. Seemingly minor details suddenly take on new significance, like the physical description on Jannie’s wanted poster: “scar in right eyebrow, small scar under left eye … scars on left arm, left shoulder, left side of chest and on right shoulder.” All of them correspond to injuries she described. The transfer from prison to St. Elizabeths? It could have been her scheming, but one document among the court papers shows that she was moved to St. Elizabeths after being diagnosed with “severe depression, catatonic withdrawal with auditory hallucinations.” Which would be understandable, given what she’d been through. Then there was her public support. Given all of the above, it suddenly seemed far more plausible that she’d simply been a genuinely good person caught up in a horrible situation who had navigated her way out as best she was able. In February 1975, a group of 30-plus people formed the Jannie Duncan Freedom Committee, raising money and circulating a petition seeking her release; they collected 5,000 signatures. Friends recruited the support of D.C. Councilwoman Willie Hardy and Walter Fauntroy, a prominent politician, pastor and civil rights advocate. More than 20 friends and employers offered to provide character statements in court on Jannie’s behalf. But after this brief bit of fanfare, she was never heard from publicly again. It was as if she dissolved into her post-prison life with all the anonymity and quasi-invisibility of her years as Joan Davis. When Jannie became frail, her daughter moved her into a nursing home. She died in May 2009, at age 89, in Chevy Chase, Maryland. Her relatives held a quiet ceremony at Scott’s Funeral Home in Richmond on a warm May afternoon, then wended their way to the Washington Memorial Park and Mausoleums in Sandston, Virginia, near her birthplace, for the burial. The circle of her life was complete. I understand her daughter’s impulse to pat down the earth over this complex tale. But as I exhumed Jannie Duncan’s full narrative, two things stood out. The first was that initial assumptions about people are often wrong. Mine were in this case — and in a time when we’re seemingly growing more alienated from each other, I was reminded to look deeper for the complexities inside all of us, our shared humanity. And second: Jannie’s story is more relevant in 2018 than ever. She was a black woman who lacked power or standing while facing a justice system dominated by white men aligned against her. She was easy to brush aside; her telling was easy to dismiss and distort. There are some lingering questions that may never be fully answered, but this much is now clear: Jannie was a survivor. And we know, after these last couple of years, that there are countless survivors today facing the same systemic hostility, the same biases, the same obstacles arrayed against them. Finally, then: This is the story of Jannie Duncan, survivor. For her sake, and the sake of others whose lives were damaged by what happened one night in March 1956, it’s tragic that no one listened then, more than six decades ago. For the rest of us, it’s not too late. Love Narratively? So do we. The vital support of loyal readers like you allows us to keep producing the one-of-a-kind human interest stories you read and love every week. But our latest Narratively story isn't available online. Instead, we printed the entire thing on a tote bag, and it's available only to Narratively Patrons. Become a Narratively Patron today and we'll send you our first-of-its-kind Storytelling Swag Bag. Then a few times a year we'll send fun surprises for you to tote around, from books we love to literary zines and much more. Our latest Narratively story isn't available online - we printed the entire thing on a tote bag! Support us by becoming a Narratively Patron and get yours today.